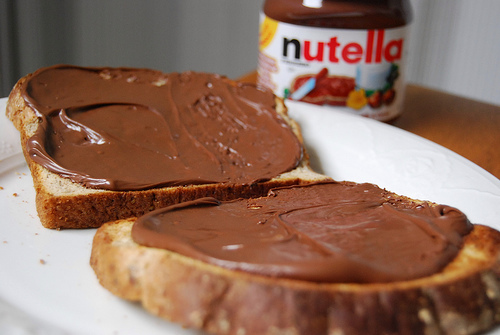 Nutella is one of those tasty spreads that once you pop the top of it, you just can’t stop. The delicious spread made of chocolate and almond used to be seen as a substitute for peanut butter, but a recent study showed that you may spread chocolate cake frosting instead of Nutella. ABC made an incredible discovery: Nutella is as healthy as the Milky Way candy bar. A single tablespoon contains 100 calories, 6 grams of fat, 2 grams of satured fat, and 11 grams of sugar. Compared to Nutella, a tablespoon of chocolate cake frosting has 75 calories, 3 grams of fat, 1 gram of satured fat, and 7.5 grams of sugar, which officially makes cake frosting healthier than Nutella. So what do you think? Still gonna eat Nutella? I still love it!